America’s Sweetheart once again. 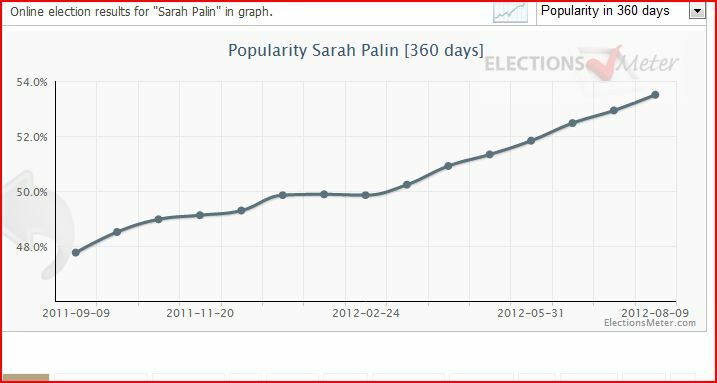 Sarah Palin’s approval rating continues on an seemingly inexorable rise as she reaches new heights for the year at 53.50% approval on the day when Reuters records Mitt Romney at 42% against President Obama. Palin is up a massive 16 points over the last twelve months. On the heels of major polling firm PPP Polling’s finding that Sarah Palin is more popular, by far, than any of the declared GOP candidates in the recent primary campaign, with a 68% approval rating AT THIS LINK and a net positive rating of +48, now a poll (graphs at bottom of this page) at Election Meter.com has her approval also at a significant level. Undertake the long struggle she has done indeed, and her tenacity seems to finally be paying off, as voters now are seeing her in a substantially positive light again. Her six-in-a-row winning endorsements for high profile campaigns, e.g. Mourdoch’s and Fischer’s come-from-behind Senate primary wins and Ted Cruz’s remarkable rise in Texas – all with Palin’s support. The perceived unfairness to Palin by the Romney team in hiring someone who has spoken negatively about her to run his campaign, and, of course, their stonewalling in Palin being invited to Tampa. Yes certainly, the Election Meter poll is an online poll and can be discounted to a degree because of that. 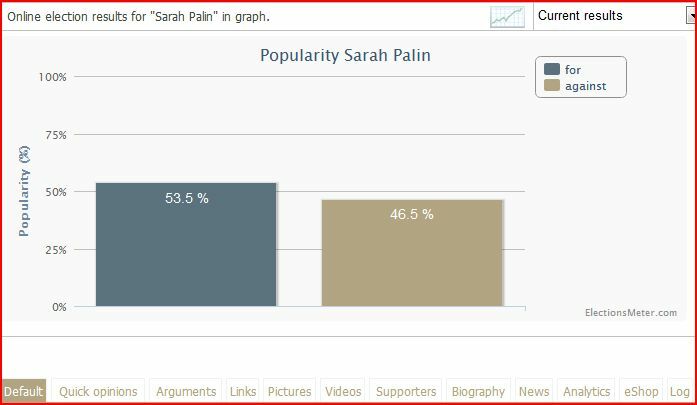 However, when Palin was at her absolute nadir in this poll in 2010 at 19.2% her enemies would have seized on it as being representative of a general feeling. There is some degree of validity to that view, although it is distorted and extreme, but on the other hand, the steady, seemingly inexorable rise since then must also reflect a wider reality – which will, of course, be ignored by her enemies. The longer term graphs, because of the time frame involved, must be valid in the wider context they support. Surely the absolute polling height of 72% in 2008 was a genuine reflection of reality at that time. In 2012, we have a unique opportunity to elect more commonsense conservatives to Congress, but that alone is not enough. We must support conservatives who are with us on the issues but not weighed down with the burden of crony capitalism that is so prevalent in Washington, D.C. Congresswoman Sandy Adams is just one of those candidates. She is running in Florida’s 7th Congressional District; and unlike her opponent, Sandy is free from the shackles of lobbyists and back door dealings in Washington. As someone who served in the military and as a career law enforcement officer, Sandy doesn’t have time or the patience for the business as usual ways of Washington. Washington insiders on both sides of the aisle have spent this country into massive debt and put our children’s future at risk. Let’s restore power to the people by electing a wise Congress that our next President can work with. Please join me and others like Congressman Allen West, Condi Rice, and Tea Party Express in supporting Sandy Adams today. Sarah Steelman fell short in her quest for the GOP’s nomination for Senator from Missouri to take on Clare McCaskill in November. Her just missing out on coming in second, from last place, was a remarkable result clearly made possible in a large part by Sarah Palin’s endorsement and active campaigning for her. The Daily Kos pollster PPP Polling (D) got the result completely wrong, quite possibly because of some inherent anti-Palin bias in their analysis. After all, PPP polling said that in Texas “Perry’s candidate (Dewhurst) will defeat Palin’s candidate” (Cruz).They also underestimated Cruz’s margin of victory in their final poll. The last PPP Poll, published on the Sunday before the election had this prediction ( and there was no mention of the possible Palin effect in their final summing up). Not only did PPP get the winner wrong by 6 points, but they were wrong on Steelman by 4 points-outside most recognized margin of error allowances. 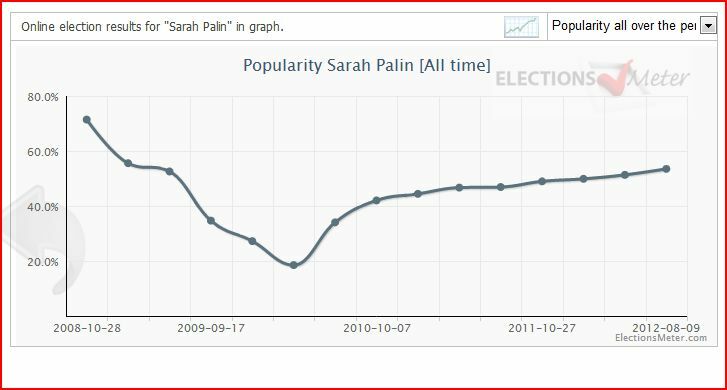 Steelman’s rise of over 4 points in effectively a few days, came subsequent to Palin’s visit which is, surely, the most logical explanation. Why Steelman did not win can be put down to, primarily surely, the massive financial disadvantage she had. Brunner was reported to have spent $10,000,000 of his own money to Steelman’s $800k. It is very difficult, even with a Palin endorsement, to overcome months of massive negative tv adverts which proved a bridge too far. Even the leftist Washington Post agreed that Palin is a major force, and that Steelman’s run would be a huge challenge for Palin to get across the finish line. The Washington Post, admitted, as the MSM now has to after Ted Cruz’s and Deb Fischer’s come from behind wins, that Palin is having a significant effect on who the GOP voters choose for November. 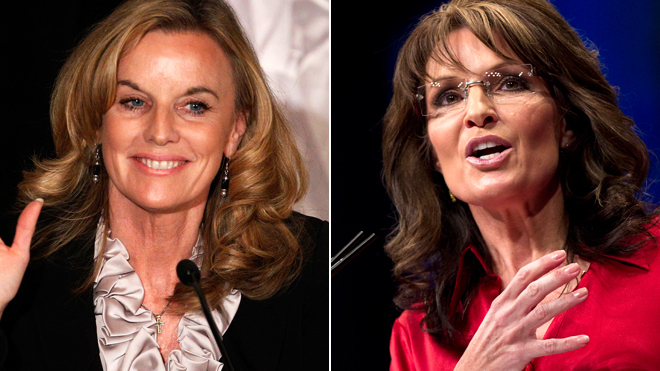 They advised that Steelman’s efforts would be “Palin’s biggest test yet”. Well, Palin has passed Washpost’s test with flying colors. It will be interesting to see what the next hurdle they place in front of her, as if of course the GOP voters care a jot. To give a truer example of the massive come from behind challenge Steelman had the poll previous to the PPP one had Steelman 20 points behind Brunner ! Polling in June had Brunner at 40% to Steelman’s 20%. In May, Brunner was the overwhelming choice of Tea Party supporters whose support Palin obviously turned around by her endorsment of Steelman. Palin’s rermakable record of endorsement winners – 6 in a row before the Missouri result – is hardly dented, given the massive disadvantages Steelman had, and the relatively short time Palin had to try and assist her to overcome them. The biggest losers are the polling firms and MSM, who consistantly write her off, and who end up with egg on their collective faces like PPP.